Notice that Paul writes to us in Philippians 3:3 and 4:4 as though, Rejoicing lies completely within our hands and our rejoicing never depends on the happenings around us. I believe this is true. You know despite the roughness and pain in the world, as Christians we can still rejoice. The secret is clearly stated in Philippians 3:3 and Philippians 4:4. It says Rejoice in the Lord, Rejoicing in Christ Jesus. That’s the Secret of Rejoicing always. Yes, continuous Joy forever is in the Lord. Rejoicing is only in the Lord. Circumcised the eight day, of the stock of Israel, of the tribe of Benjamin, a Hebrew of the Hebrews; concerning the law, a Pharisee; concerning zeal, persecuting the church; concerning the righteousness which is in the law, blameless. But what things were gain to me, these I have counted loss for Christ, Yet indeed I also count all things loss for the excellence of the knowledge of Christ Jesus my Lord… (Phil. 3:5 – 8). Paul, despite being in chains while writing this could rejoice and even implore others to rejoice because he was focusing his attention on what Christ was doing in Him. He could see the kind of Paul he was before, the kind of Paul he was now, and then could acknowledge Christ’s work in him. Paul wasn’t putting his attention on himself, the light was on Christ in him. So he could rejoice always. Rejoicing always is in Christ. Joy is in counting those things that makes us puffed up and proud and make us want to boast as dung and irrelevant. 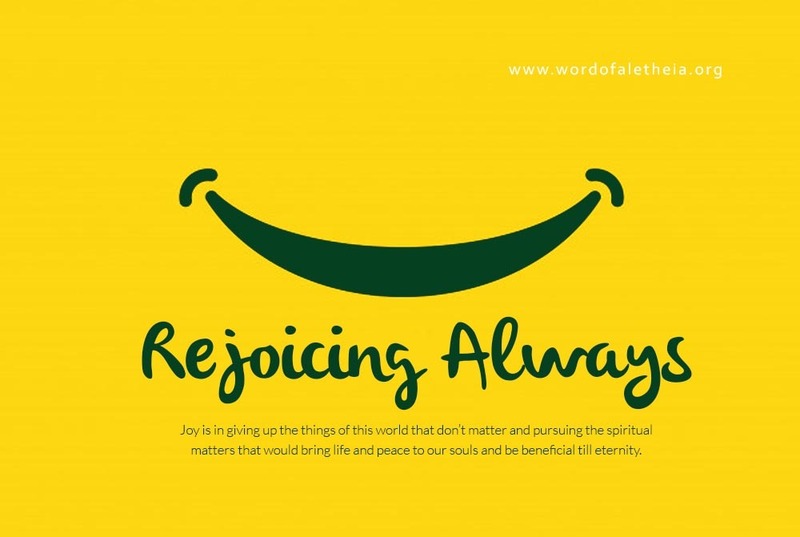 Rejoicing always is in pushing aside those things we always like to rely on outside of Christ, so that we can enjoy the true riches of rejoicing in Christ. You know the source of sorrows and sadness, is when we fill our minds with what we expect to happen to us or not happen to us. When our focus is outward and not in inward on Christ Jesus in us. Only Men of true joy can do what he said 2 Cor. 4:8 – 9 above, men who don’t bother about what is happening around them, their focus and pursuit is on Christ. Joy is keeping our gaze on Him. Joy is about Him and what he does, not what is happening to me. Rejoicing always is in Christ and in Christ alone. Philippians 4: 8 – 9 tells us the things we should focus our minds on that brings Joy. Another source of Joy, Paul mentions is helping other believers, and especially those who labour in the work of Christ. He commands us to rejoice. He gave us the spirit. We only have to keep our gaze on him. Pursue the knowledge of Him. Focus our attention on what He is doing in us, who He is making us to be like. Know that Rejoicing always is only possible in Him. Rejoice always IN CHRIST and once again I say Rejoice. So, Last week I wrote about BREAKING FREE FROM RELIGION. I got some responses from some of my readers, encouraging me to keep up with the good work as they have been blessed by the write-up. 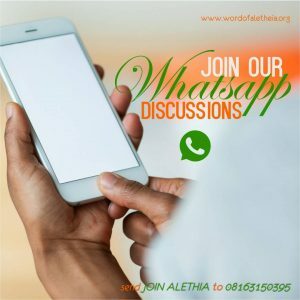 On this premise, I would like to say a big THANK YOU to everyone that dropped a comment and to let you know that every word of encouragement meant a lot to me and the ALETHEIA COMMITTEE. But more importantly would be that we have the right reaction(s) to every of God’s word each time He speaks to us. Interestingly this would be the central theme of our article this week. Whenever we read the Bible or read a scripture-inspired book or write-up or rather listen to a sermon, it’s important to know that the words spoken to us will only profit us if we make the right reaction(s) to them. Looking through the scripture, different reactions to God’s words played out when it came to people. Some disagreed, some disbelieved, some rejected while some took it up in faith and acted accordingly. Sarah also laughed in unbelief when God said she would have a son in a year time (Gen. 18: 11 -15). They all seemed to have logical reasons not to believe God’s word. You know sometimes we also do the same. 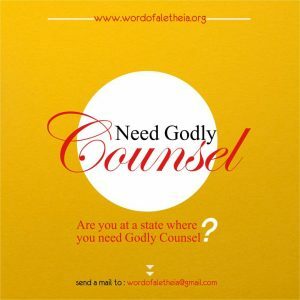 Even after our Pastors have declared God’s beautiful counsels to us, we still go ahead to esteem more our physical limitations than God’s word. We act in unbelief. We prefer to keep living in fear and worry than to rise up and boldly believe and confess God’s word to us. I act in unbelief sometimes too, am not an exception but it’s not right. We see God as a Compound Capital Fool. We see our problems to be bigger than God and His word. Today, Let our hearts be grounded in the knowledge of how great our God is and the powerful potential of our faith in Him. One of the things that interested me most was that Abraham didn’t just react rightly by obeying, He rose up early to obey God. Don’t blame God for making him the Father of all Nations. This was his only son of whom he had waited for a long time to have without any hope of having another, he even had to ride 3 days before he could locate this mountain God told him to go to. Yet, he didn’t change his mind. What is your own Isaac, Your Isaac could be your academics, husband, job, or whatever, think about If God says sacrifice it! Can you? Can you rise up early to terminate it? One of my heart desires, as always been “Lord I don’t want to just be a hearer of your word, accumulating knowledge but a doer. Joshua and Caleb is also another example. They were 2 of 12 spies sent by Israel to spy the Promised Land. God had told these people the land was for them, He wanted them to go up and take up what He had assigned and allocated them, yet because of what they saw they were terrified. They esteemed their challenges higher than God. Their challenges were more real to them than God’s word. But Joshua and Caleb said, “If God says it, we believe it and that settles it”. What do you also say concerning all of God’s promises to you in the scriptures, do you believe them? Or are you more persuaded of your current challenges than God’s word? Paul also said “Lord, what would you have me do” (Acts 9:6). Isaiah said, “Here I am, send me Lord”(Isaiah 6:8). You can read the full accounts in the scriptures indicated. 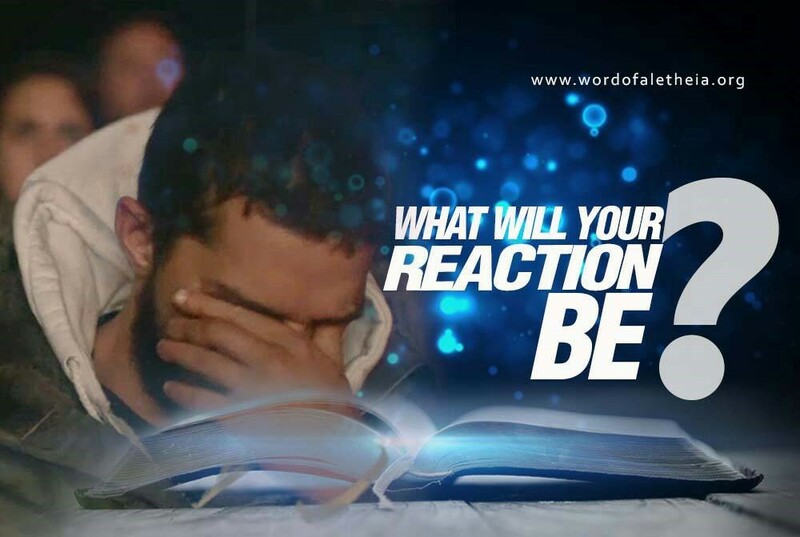 When God words, comes to you what would your reactions be? Yes. What would your reaction be even to this article? Positive, Negative, Discard, Find excuses. The ball is in your court but imagine if for every book we read, every sermon we listen to, every time we read the bible we gave the right reactions, we would be far more blessed than we are right now. 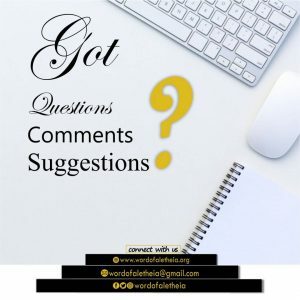 My dear reader, I ask you to ponder on this words, ask the Holy-Spirit to reveal to you where you aren’t responding to His word well enough and also give you the grace to respond positively. I got hooked on a dance movie called “Step Up”. These young people – in spite of their differences – united themselves to express their passion through dance. They recruited, practiced, and competed not only to win the prize, but also to be heard in their community. They challenged people to make a difference. These young people stepped up! I’m not ready yet. I wouldn’t know what to do. I’m not worthy. I’m not good enough to serve God. I’m not that gifted. There are others who can be more effective. I’m too busy. I have a lot of things to fix first in my life. Though some people may have the desire to serve, they often lack the confidence. And this is because they feel that they are not yet equipped. But here’s the good news! Jesus is not expecting us to perform. He is not expecting us to make a first class impression on him. Jesus simply wants our obedience to answer His call to follow Him. And when we make that first step, He will open doors of opportunity for us to grow, to be trained, and to serve in the ministry according to our gifts. There is a saying that goes, “When God calls, God equips.” Equipping and learning from Jesus is a lifetime journey. 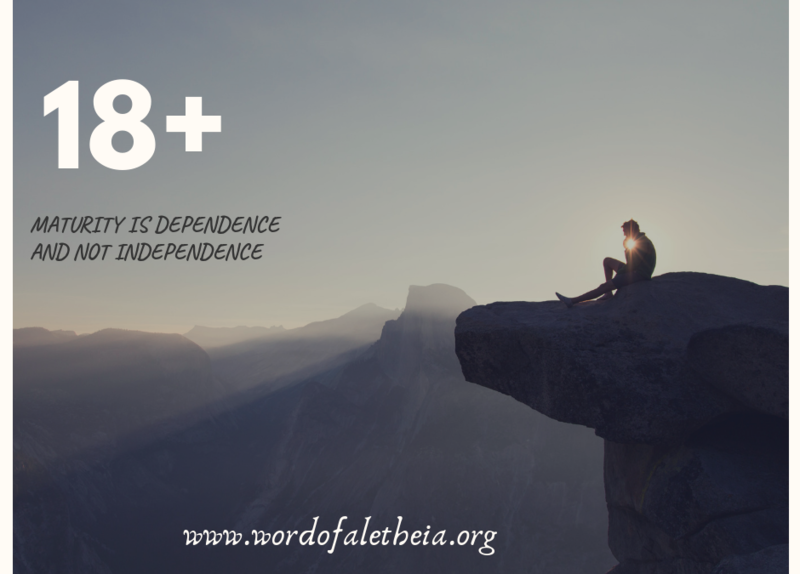 A heart of obedience, humility, and being teachable are the only requirements to do His ministry work. When Jesus commissioned His disciples, He gave them the assurance of His presence wherever they would go. “And surely I am with you always, to the very end of the age.” (Matthew 28:20). Jesus will never leave your side. He will be your guide, your mentor, and your teacher. It’s about time to step up, my friend. Pray and discern where God is leading you to serve in the ministry. Be equipped for the work of service. 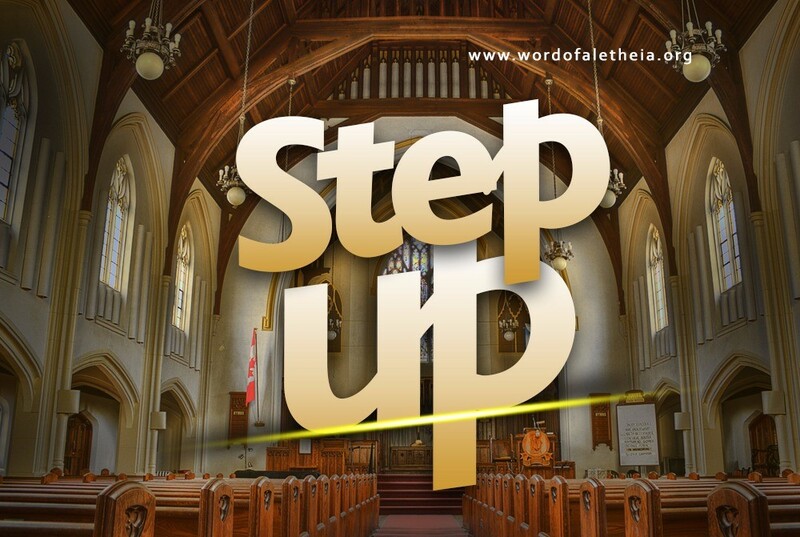 Step up and make a difference in the Kingdom of God! Our journey toward Christ-likeness involves an absolute surrender to Jesus Christ. Surrendering absolutely happens when a person is willing to follow Christ no matter the cost. It is more than commitment, it is more than involvement. It may cost you some discomfort, your personal desires and aspirations in life. We can be committed but not surrendered. Jesus is looking for a heart that is completely broken and surrendered to Him. Absolute surrender to Christ focuses not on our doing but centers on our being, not in our competence but in our character. “Then Jesus said to his disciples, “Whoever wants to be my disciple must deny themselves, take up their cross and follow me.” Matthew 16:24. To be completely surrendered to Christ one must deny himself. To deny yourself is you have to die to your earthly passion. Christ must be the center and supreme purpose of your life. 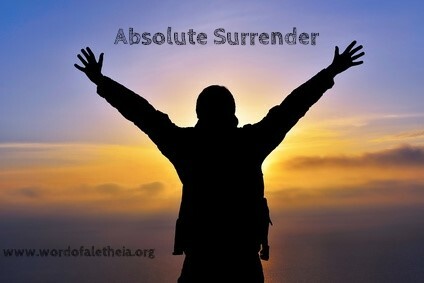 Paul the great apostle understood what it means to live a life of an absolute surrender to Christ. He said, “I have been crucified with Christ and I no longer live, but Christ lives in me. The life I live in the body, I live by faith in the Son of God, who loved me and gave himself for me.” Galatians 2:20. He considered himself dead but alive for Christ. His life is not his own to manage. His life purpose and goal was for Christ and His glory. The evidences of a totally surrendered life to Christ is spiritual transformation, a powerful living testimony that would lead to effective ministry for the glory of God. Are you surrendered to Christ? Are you absolutely surrendered to Him? 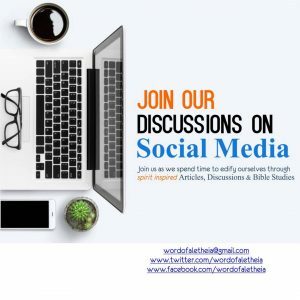 Over-time I have discovered as a writer that my readers relate most when I explain scripture as I have applied them to my personal experiences. This approach brings more light to the bible, those stories tend to stick more to the mind, and they are always enticing to read. Let me give you an illustration. I have noticed that when two people are in love, they have an overwhelming desire to share moments together but if they are not talking for quite some hours or – even worse a full day- , there must be a problem. The same relationship can be seen between a Christian and the Holy Spirit. The Holy Spirit has emotions, He can be grieved (Eph. 4:30) and He loves. Many of us often forget that the Holy-spirit always wants our company, he doesn’t like to be ignored, he has been given to always be with you when you sleep, when you walk the streets, when you eat, when you drink.Every-time, every second, he wants us to talk with him, he wants our attention. He wants us to tell him our challenges, and he wants to also talk with us, he wants to give us wisdom on how to make decisions, he wants to tell us more about God’s kingdom. He wants our fellowship. He wants us to STAY CONNECTED. He doesn’t just want 10 minutes out of the 24 hours of our day. He is not an errand boy. He is our love. 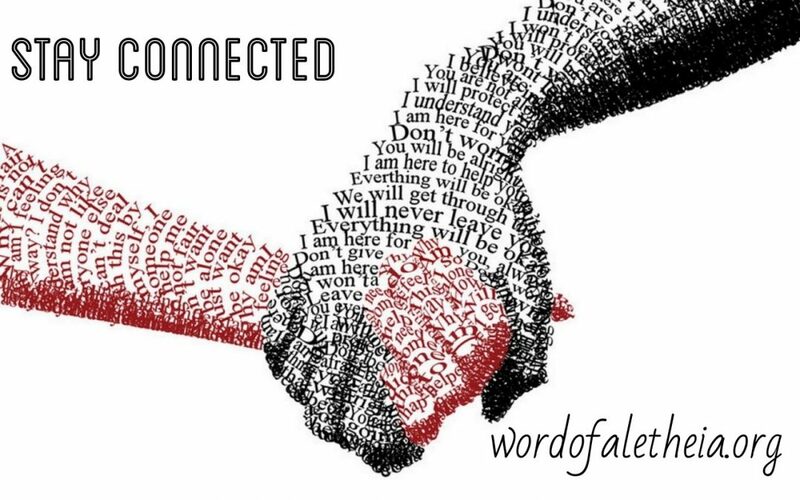 If we will be diligent enough to stay connected and be careful we will learn a lot from our day to day experiences.Let me share two lessons which I learned in the past weeks. I hope it encourages our heart. After my exams, my plan was to immediately take a vacation. I wanted to visit some nearby countries to give my brain a good break . I was so tired from studying. I planned the trip with two of my friends. They planned the flights, the buses and the accommodations, and we shared the bill. The trip was really beautiful -peaceful flights, nice discussions, sweet meals, interesting places.It was fun! In Amsterdam, my friends had planned that all night we would keep walking around and to see places , so they didn’t bother to book a room that night. Since I didn’t plan with them, I didn’t know this,. Unfortunately, our planned night tour in city was far below expectations. We had already seen all the interesting places that day and by night-time we were all really tired. We couldn’t leave the city because our bus was booked for the next morning according to the plan. The night wasn’t comfortable at all. We were visitors with no place to sleep. The only place available was the concrete seats at the Central Train Station. And even though we were tired and weak, the security men allowed us to only sit and not sleep. And we were like that all night! In the midst of this, the Holy Spirit said to me that this is an illustration of Christians on earth. Christians are sojourners, we are travellers.We shouldn’t expect luxurious comfort here on earth. Our comfort comes when we remember our home, the place where we can finally be with God in body. Many Christians get distracted by seeking comfort here on earth. Paul speaking, said when we are pressed on all sides, we must keep moving. Our encouragement is that one day we will be home. Every traveller is encouraged at the thought of the word HOME. It’s always an encouragement. It always gives strength and hope. Likewise we are supposed to be encouraged as Christians. Our consolation shouldn’t be from the things here. To continue the story, we survived the night, travelled to Belgium where we had booked a room. We were all tired resulting from a sleepless night. We just wanted to check into the room and rest before going around to see that city. Then we encountered another problem. We couldn’t check into our room. We felt like dying. Just then I remembered that a day before I travelled, I was sharing with a friend about my trip. Then he said “hey, my parents live in Belgium have their contact in-case you need a place to stay”. I never asked for their contact, in-fact I was merely sharing it with him, so we could pray together about it. I never saw the need to have their contact, because I believed all had been settled by my friends. I reluctantly collected their contact. It was when we were denied entry into the room that I remembered my friend’s parent. They were very kind and hospitable to us. We had a nice dinner together with them, with very soft and cosy beds and they even drove us again to the airport the next morning, to catch our flight.. We lost a room and got a house. We wished we had planned to stay longer with them. Out of this experience, Psalms 46:1 made more meaning to me. God had seen that we were going to be in need of a place to be, and he made adequate preparation for us. The help was suited and crafted to perfectly suit the trouble we had. It was timely. This once again made me learn to trust God. Now, I know even better “He’s got my back”. Many of us are worried about the future not knowing that God has made adequate preparation for it without Him informing us, He only wants us to cast our cares upon him. It’s like when parents are expecting a baby, they make ready everything for the baby, the baby doesn’t have to worry about what to eat, what to wear, or how to live. It’s made ready, the baby just comes to enjoy it. We are also “God’s Baby”. Let’s learn to trust in the provisions already made by our father.